The area around the Great Apartment is brilliant for all kinds of shopping. 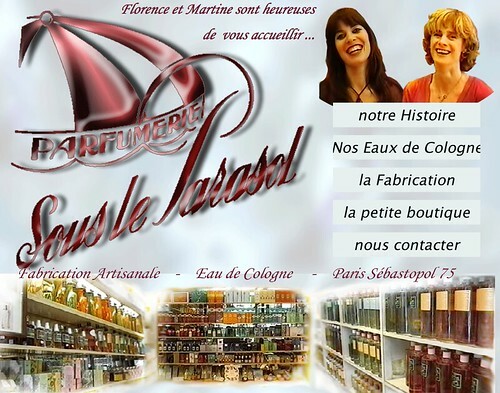 There's the Forum des Halles just five minutes away (168 stores!) where you can Zara and H&M your day away (as well as visit the enormous FNAC multimedia store -perhaps the biggest record shops and bookstore in town - or see a movie at the biggest multiplex in France: 19 screens! 3.2 millions annual visitors!). 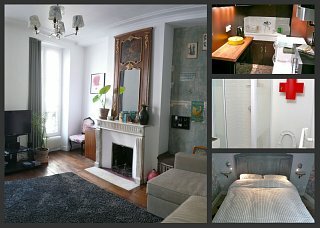 Then there's the Marais, with all its designers boutiques, great places like Les Milles Feuilles and Merci, and a whole street - rue des Francs Bourgeois - open on a Sunday (which might not sound like much to you, but it's a pretty big deal for us). 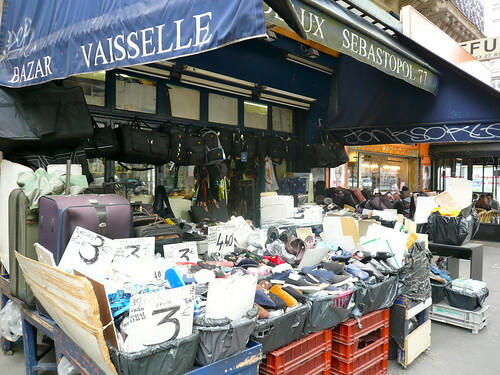 However, Paris shopping isn't all fashion, glitz and bumping into Brangelina. I've got to know the area around our place pretty well, and despite all the great stuff, it has to be said that there's also a fair share of WTF-ness that beggars belief. 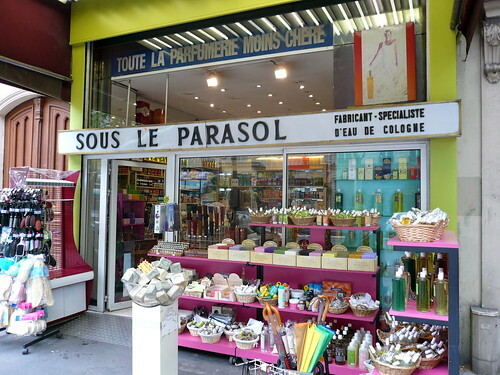 Take 77 boulevard de Sébastopol for example, just opposite our great organic supermarket. 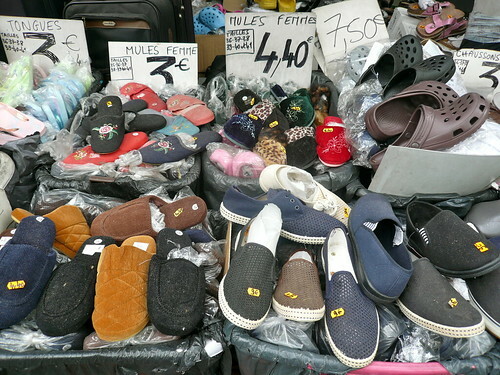 The awning says 'gift ideas', but their display of laundry baskets and black bin liners has piles of crusty shoes and slippers that I wouldn't dare put my hand into, never mind my foot. 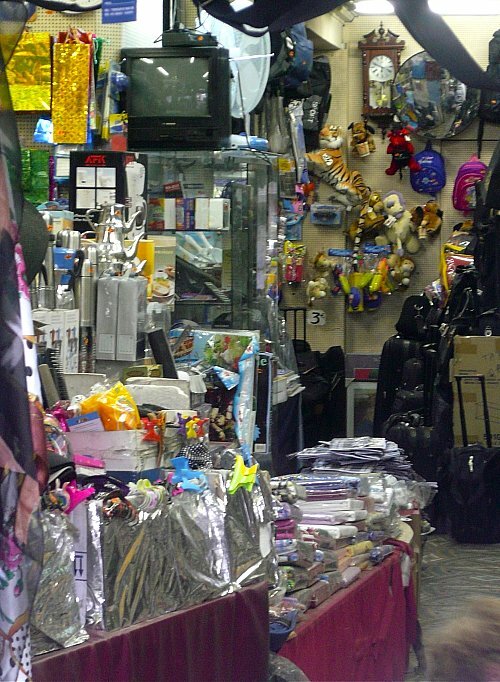 I sneaked a photo of the interior as well, revealing a sort of Aladdin's Dump of neons, nonsense and crap. How/whether they make any money is beyond me. 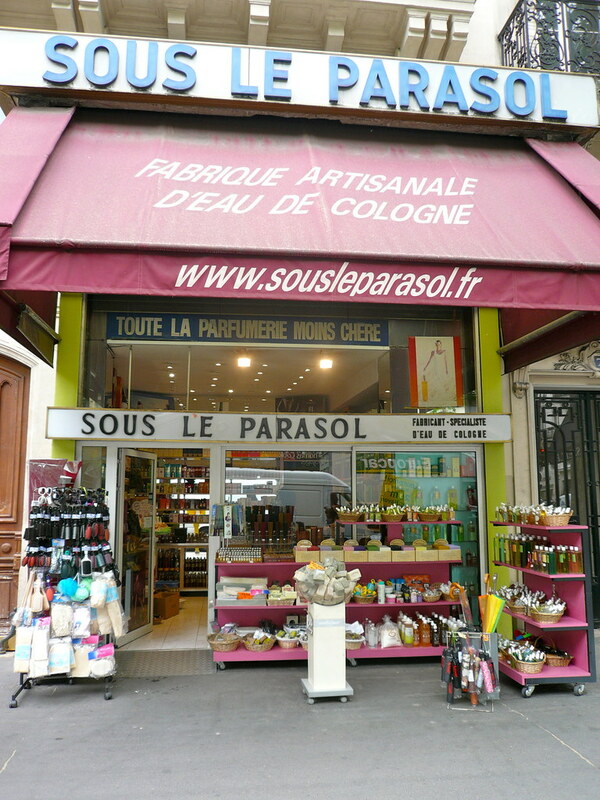 Just next door is another shop from a bygone age: Sous le Parasol, supposedly a bespoke perfumery (they make their own and have done so since before the war). Slightly less scary than next door, the shop hasn't really been renovated since the sixties it would seem and their website dates from a time when HTML was written using a fountain pen. However, if you're looking for slightly strange soap or a hair brush (? ), jaundiced Florence and Martine will probably be able to help. I always have a little laugh when I go past Goth store New Rock on rue de Turbigo too. It's mean of me, I know, but I can't help it. I never understood the idea of dressing as a Goth to look different (because to me a lot of Goths look very much the same). Plus, all those buckles and long coats must be very heavy and hot in the summer, and I'm not convinced I look good in white makeup. 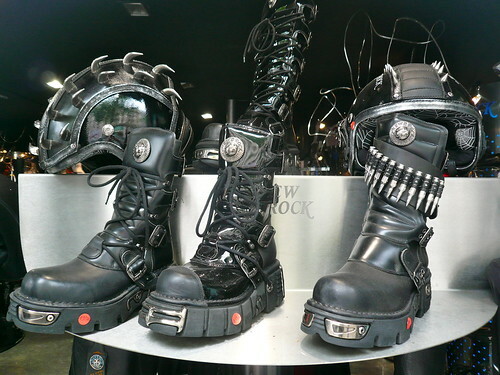 Anyway, they seem to have plenty of custom... and a large collection of ridiculously large boots at ridiculous prices. 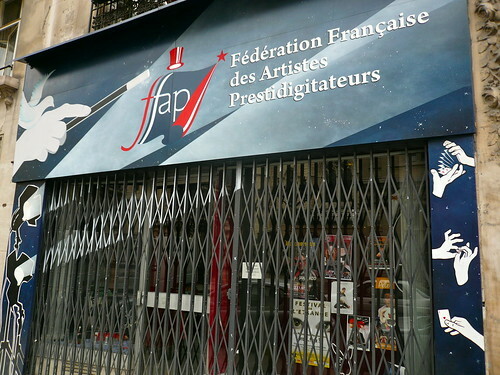 Yep, the French Federation of Performing Magicians. Very rarely open for some reason. 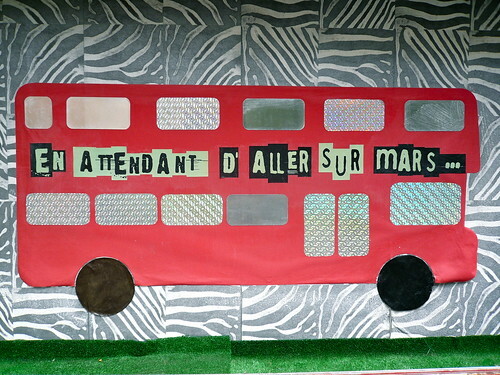 And finally, my favourite, just near the Great Apartment on rue Saint Martin : En Attendant d'Aller Sur Mars (Whilst Waiting To Go To Mars). 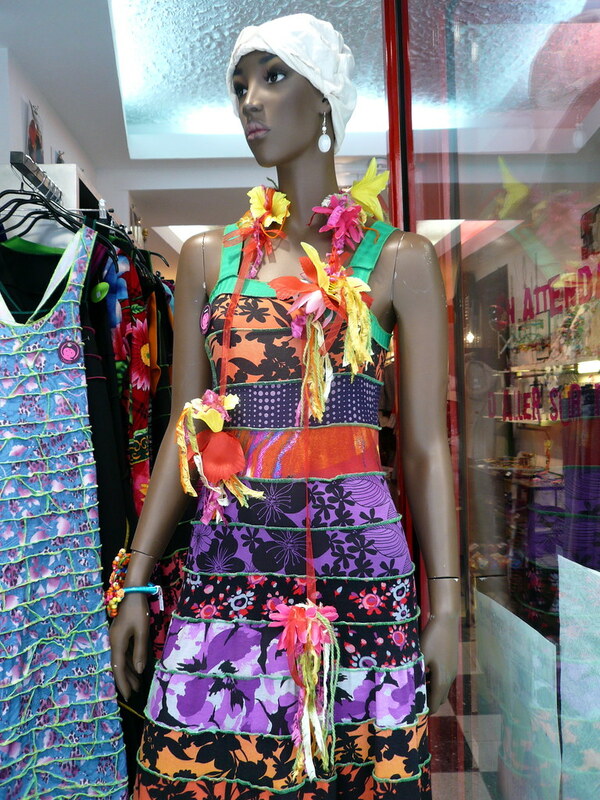 They too have a website of unspeakable ugliness and a shop that is very, very scary, somewhere between Ibiza hippy rave, sewing machine acid trip and OMFG WHO THE HELL COULD EVER WEAR THIS CRAP? Truly worthy of being featured on Regretsy, their window display is enough to make you want to cross over the street. 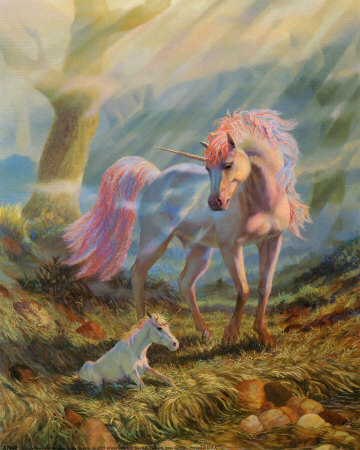 If I were a drag queen, this is what I would ceremoniously burn. Even the shop dummy looks decidedly whatever about it. But hey, what do I know about fashion?